Miss Mulatto has a tattoo on her sternum in red ink reading “trust no one”. LIGHTS has a tattoo at the center of her chest featuring a butterfly inside of a cameo-style frame. Butterflies appear a few times in LIGHTS’ Skin&Earth comic book series, and most importantly a butterfly leads her character En through the woods to an important discovery. 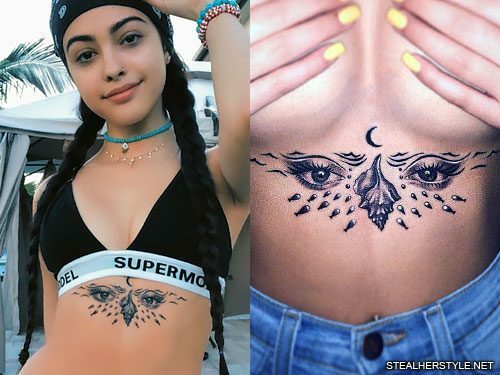 Malu Trevejo got a surrealist design tattooed on the center of her chest in June 2018. Her tattoo artist Alex Chiong created the unique ocean-inspired design by superimposing multiple images on top of each other. There are a pair of eyes inked below Malu’s breasts and a conch shell where the woman’s nose would be. A school of fish fills in the space on the bottom while the top of the design features curved lines that represent waves and sea birds. 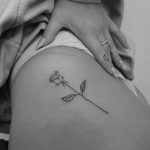 On top of the tattoo is a little black crescent moon, which is often a symbol for women since the menstrual cycle lines up with the lunar cycle. The moon also controls the tides of the ocean. 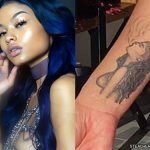 Malu’s young age is always a source of controversy every time she gets a new tattoo, but this time things don’t add up. 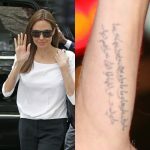 The tattoo was done by a licensed artist at a reputable parlor in Florida, where it is only legal to tattoo a minor with parental consent if they are 16 or older — and Malu was 15. The artist actually defended himself by posting a picture on instagram of Malu posing with police officers and wrote “Try again guys Malú is not 13 you guys are haters and her mom is here everyone and everything is fine.” Someone watching her livestream had called the cops who showed up at the parlor but did nothing. 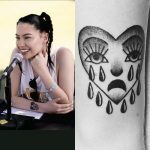 So either Malu has been lying about her age and she’s older than she says, or, more likely, she and her mom lied to the tattoo artist and the police and said that she was 16. 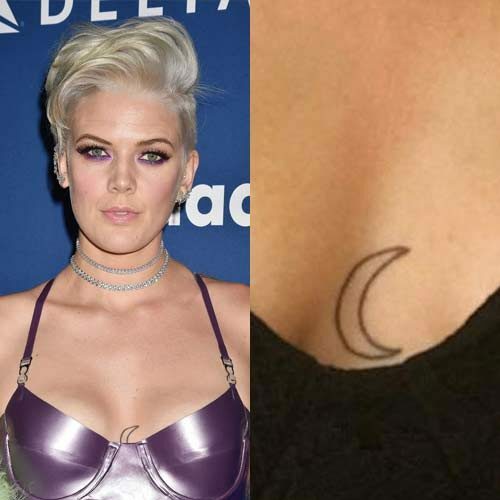 Betty Who has a moon tattoo on her chest. 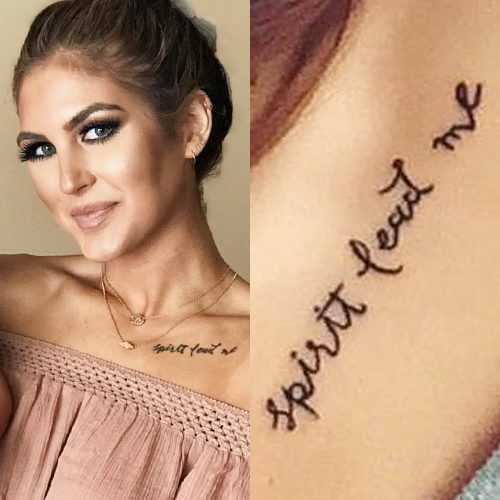 Paige Danielle has a tattoo on her sternum reading “spirit lead me”. 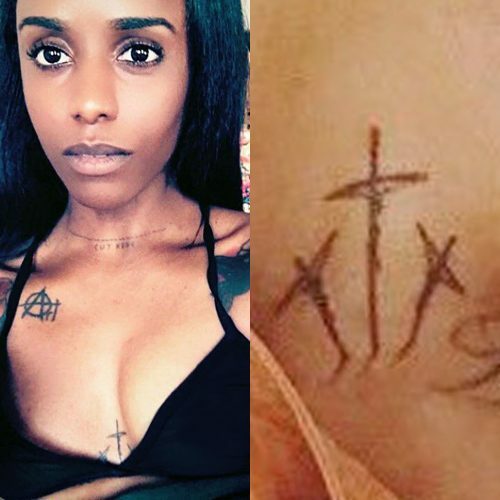 Angel Haze has three crosses tattooed on her sternum. Frances Bean Cobain has the “K” initial in the memory of his father inked on her chest. Frances has the same ‘K’ tattoo as her mother, the only difference being is that Courtney has on her abdomen. 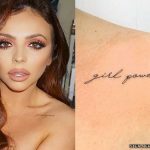 Cheryl Cole got this little swirl tattoo on the center of her chest from artist Nikko Hurtado in April 2016. The design is a Buddhist unalome which represents enlightenment. 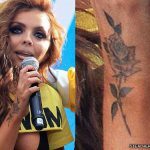 If the top of the tattoo symbolizes the destination, the swirls symbolize the journey — which is often indirect but gets more refined as you get closer to the goal. It shows that you are making progress even when it feels like you’re treading backwards. Paloma Ford has an Arabic script tattoo on her chest.